Eurostat just published a news release that in 2017 energy consumption in the EU, again, has increased 1% compared to the year before. For three years in a row now energy consumption in EU28 is increasing. This makes it more difficult to achieve the energy efficiency improvement target. In 2020 energy consumption should be 20% lower than baseline projections, in 2030 32,5%. (see Eurostat-news). Let’s have a look at history. How did the energy consumption of the 28 countries that now are part of the EU develop from 1965 onwards. Since early 2000s biofuels in transport have been supported by policy. For two reasons. One is the contribution they make to carbon reduction and the other for their capacity to reducing the fossil oil dependency of the transport sector. Biofuels are blended in transport fuel. First, the Biofuels Directive (2003/30/EC) targeted a 5.75% share by 2010. Then, the Renewable Energy Directive (RED – 2009/28/EC) set a target for 2020: 10% of energy in road transport should be of renewable origin. The RED also introduced sustainability requirements with minimum GHG-savings. In 2015 the RED was amended to incorporate issues on ILUC (Indirect Land Use Change) and capping the contribution of crop-based biofuels to 7%, shifting the focus to advanced biofuels (Directive 2015/1513/EU). 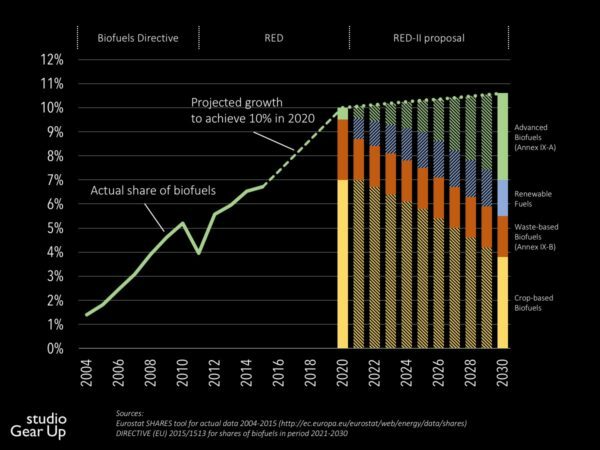 The proposal for RED II extends its focus to advanced biofuels and renewable fuels (renewable electricity directly or converted to liquid or gaseous fuels) and sees them grow to 6,8%. And it will be this 6,8% share that economic operators will be obligated to fulfill. 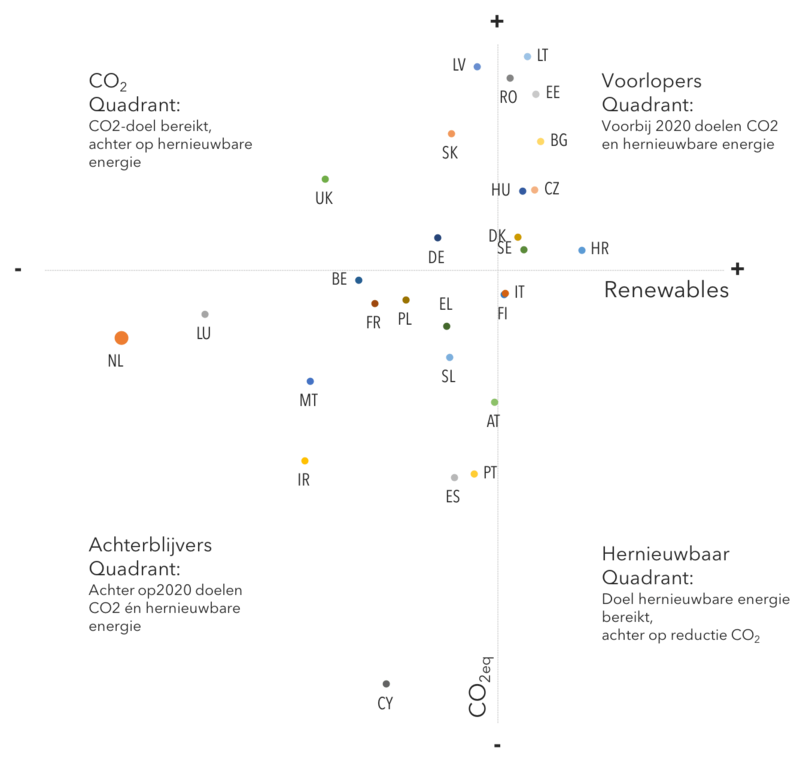 Although December 2016 shows another record-high for electric vehicles in the Netherlands, also other low-carbon options are urgently needed to further reduce transport emissions. 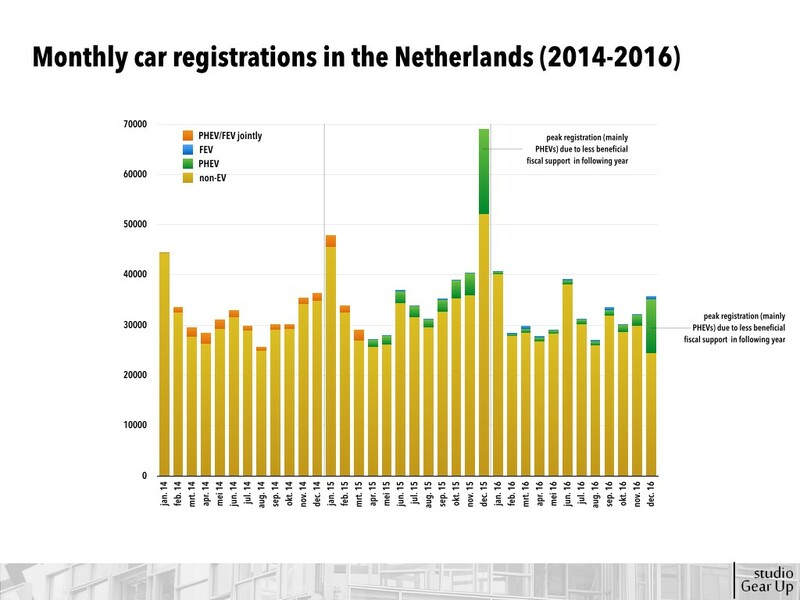 31,6%, in December 2016, has been the highest share for full electric (FEV) and plug-in hybrid electric (PHEV) passengers vehicles in the monthly new car registrations in the Netherlands so far. The previous record was set in December 2015 (24,6% share for EVs). December 2016 showed another important milestone: total EVs registrations has topped over the 100 thousand, since their introduction around 2012. Yet, the EV market uptake in 2016 slowed down and was 36% less than in 2015, mainly due to a sobered fiscal support scheme for PHEVs. At the COP21 in Paris, 195 countries adopted the Climate Agreement to limit the rise of global temperature “to well below 2 ºC above pre-industrial levels and pursuing efforts to limit temperature increase to 1.5 ºC. Now it is up to all countries to show their leadership. Their Pledges have to transform into actions to bring down greenhouse gas emissions to reach a climate-neutral and sustainable future. The strong dominance of fossil resources (share-wise) in energy consumption can make it easy to overlook the disruptive changes that are taking place in today’s energy landscape: for more than a decade now, total energy consumption is going down in the European Union – at the cost of fossil fuels. 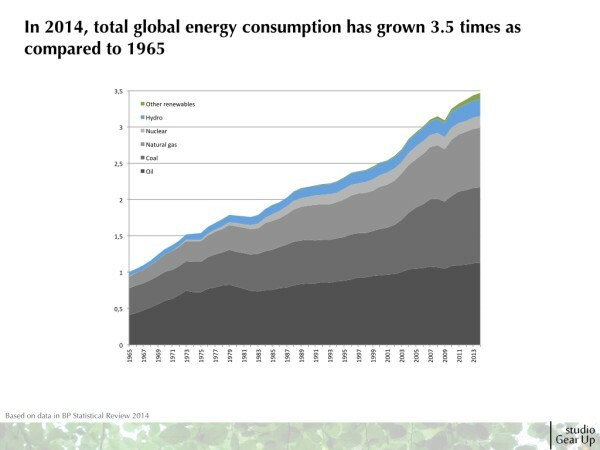 Only renewable based energy consumption is growing. 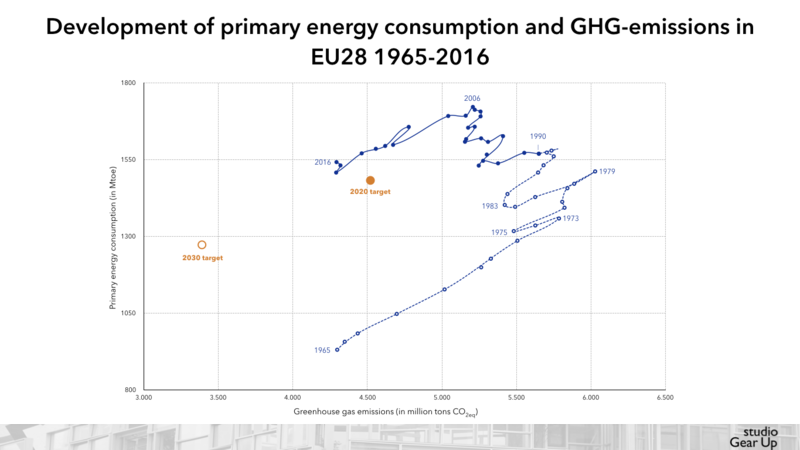 Energy consumption from renewabe resources (solar, wind, geothermal, bioenery) shows a hyperbolic curve – flat from 1965 to the end of the 1980s, curving in the 1990s and going steep up in share in this century. In 2014 the combined hydro and other renewables energy consumption bypassed nuclear and has climbed to 75% of the coal based consumption level. The graph below presents which resources fueled growth in a given year compared to the year before. Oil, gas, to a lesser extent coal, and in the 80s nuclear were the resources used for energy consumption growth – up to 2004. From that year on dominancy has been taken over by hydro and other renewables. The COP21 conference in Paris is approaching and the EU 2030 energy and climate targets are set – as well as the low carbon economy vision for 2050. 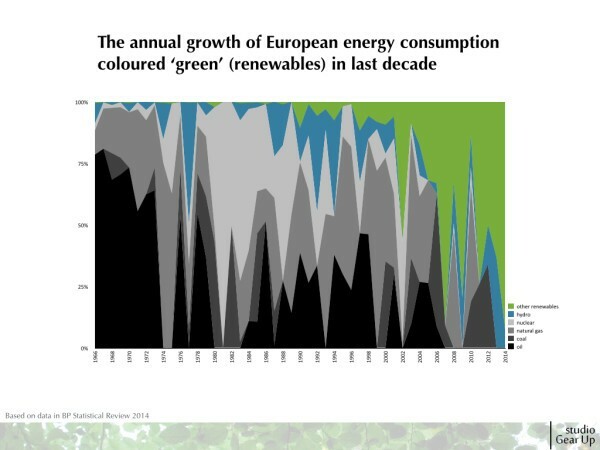 It is clear which ‘colour’ will dominate Europe’s energy landscape in the decades that come. 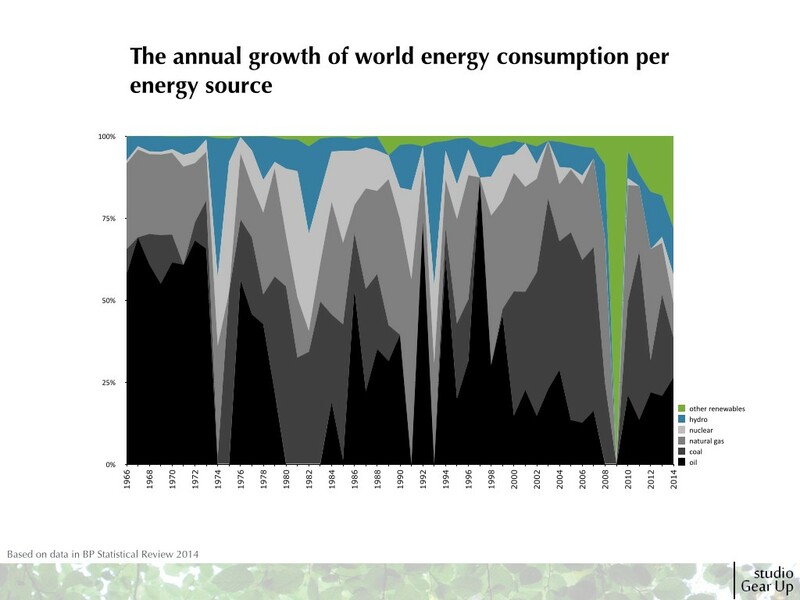 Over 2014 the world’s energy consumption has increased as can be conluded on basis of the June-2015 numbers of the BP Energy Statistical Review. The majority of resources to fuel this growth are still fossil based. 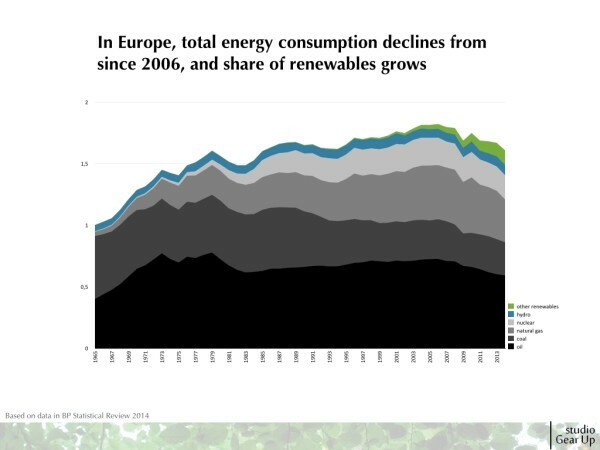 The share of renewables is rapidly growing in importance. However, decreasing world fossil fuel consumption and fueling the growing energy consumption by renewable sources still remains a daunting challenge. The growth of fossil fuels and renewables from 2008 (credit crisis) onward, tends towards reaching growth parity. The big question is when will the growth of the world’s renewable energy consumption turn into growth dominancy? Tuesday, March 31, Mrs. Hendricks, the German Minister of Environment, pointed out that after three years of increasing CO2 emissions in Germany, “the trend finally points into the right direction”. Germany saw 4,3% lower CO2 emissions in 2014. It is a start, but a lot has to be done to further decarbonize Germans energy consumption to reach its 2020 energy targets. Germany presented an ambitious Action Plan to give yet another fierce impulse to the decarbonization of Germany’s energy consumption in december 2014. 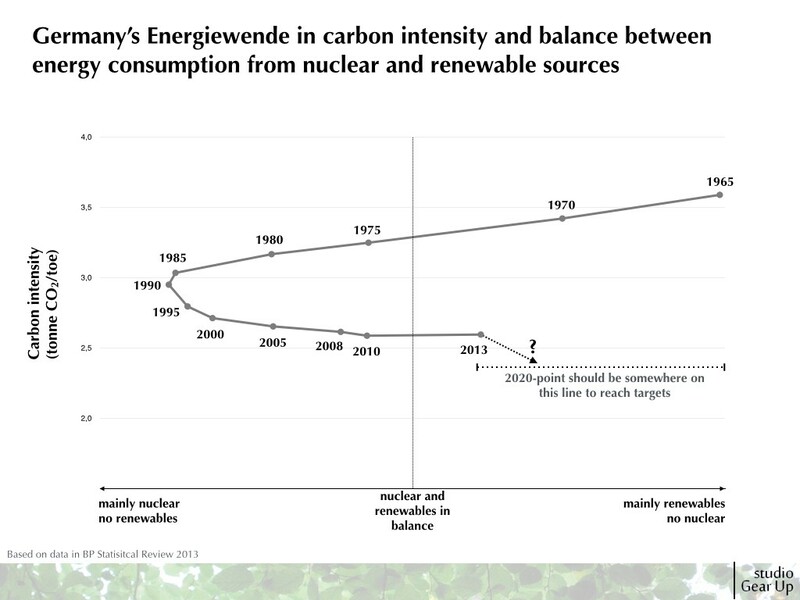 Though the ‘Energiewende’ is progressing (see graph), the ambition is challenging, in two ways. Firstly, by 2020 the total CO2-emissions must be 40% less than they were in 1990. Secondly, the total energy consumption must be 20% lower than it was in 2008. 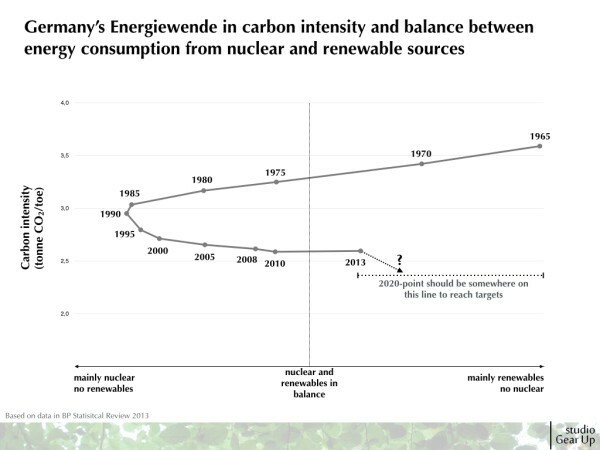 However, as the graph shows the downward trend to decarbonize Germany’s energy consumption has flattened. Even though the use of renewable energy has grown dramatically. Obviously decreasing the use of coal will help. But also an ‘Energiewende 2.0’ in oil consumption is urgently needed. 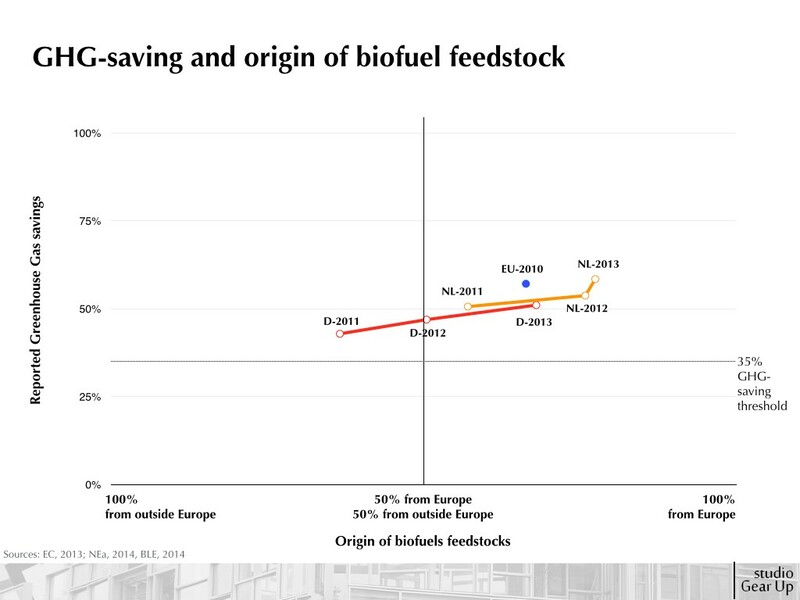 Europe-based feedstocks for biofuels have gained dominancy in the last couple of years official reporting in the Netherlands and Germany shows. Also the greenhouse gas (GHG) savings established by the use of biofuels in these two countries have increased. Europe is currenlty debating the pathways to a decarbonized, resource efficient and energy independent Europe. The numbers in this graph demonstrate how biofuel GHG-savings and feedstock origin are contributing to these objectives. Plotting the 2010 performance of the entire EU* causes some confusion. Both the GHG-saving and feedstock origin 2010 figures for the EU are higher than one would expect from the Dutch and German performances over 2011 till 2013 . 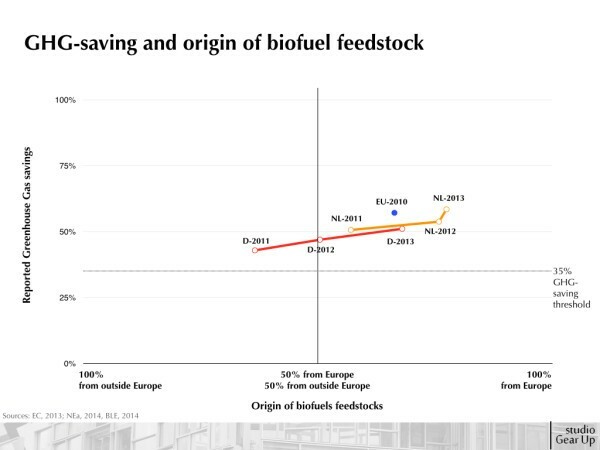 Are other countries achieving higher GHG-saving levels and significantly using more European feedstocks? A more detailed analysis of the performances of other member states will be needed to clarify. *The EU performance are based on the in 2013 by the European Commission (EC) published Renewable Energy Report. The newest EC Renewable Energy Progress report is expected to be published soon. It will bring clarity on the 2012 performance and enable comparison to the performances as reported in the Netherlands and Germany.